John Quincey Adams, Co. K, 47th U.S.C.T. (8th Regt. Louisiana Inf.) Died 8/20/64. 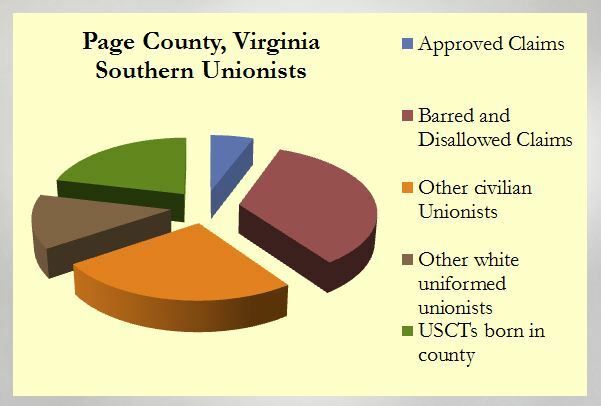 Note: This is not yet nor, in all probability, will it ever be an all-inclusive listing of civilians in Page County, Virginia who could be considered Unionists. The Southern Loyalist Claims helped to define this list and will be further reinforced with information gleaned from old editions of the Page News & Courier. However, many who wished to remain safe from any harm simply kept their sentiments to themselves. In addition to this list and the list of Union soldiers from Page County, I will include, sometime in the future, a new set of lists referring to the “reluctant” and the “disaffected” when it came to the Confederate Cause. Essentially, the “reluctant” list will show those who can easily be identified as reluctant to serve in the Confederate military – including a fair number who lied about their ages in 1864 to remain out of regular field service units and remain at home in the local reserve unit (8th Battalion Virginia Reserves, CSA). The “disaffected” list will show those who became disheartened with the Confederate Cause for one reason or another, including those who deserted from the Confederate army and went North for the duration of the war. Though they may not have necessarily been Unionists, identifying them within this listing helps to clarify the range of sentiments that actually existed.